Do you want to be part of an exciting organization that educates and entertains people from around the world? 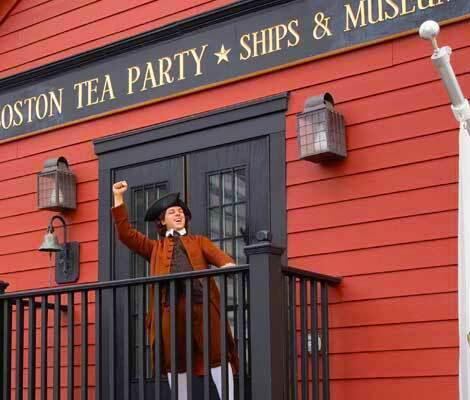 The Boston Tea Party Ships & Museum hires exceptional people who are looking to be part of a dynamic team of motivated CAST members who work together to tell the story of the single most important event leading up to the American Revolution—the Boston Tea Party! Can you picture yourself in a job where you wear period clothing all day, and portray someone connected to one of the most iconic stories in our nation’s history? Are you a well-spoken, outgoing person who loves history and would love to spend your days discussing history with people from around the world? Are you a performer that loves interacting with your audiences? Are you hard working, dependable, and can provide customer service second to none? Apply for an Actor/Interpreter position with us! Our actor/interpreters come from various backgrounds, and past theatrical experience is not necessarily required, but an enthusiasm for history and storytelling is. Join the staff of the best gift shop in Boston! Our gift shop features tea related merchandise, historical and nautical items and replicas, ship models, clothing, and historical books. Courtesy and hospitality is extended in full measure to every guest. If you’d like to join a team of friendly and outgoing customer service oriented individuals, then apply for a sales associate position today! Abigail’s Tea Room is always looking for hard working and friendly people to join our Tea Room staff. Abigail’s Tea Room offers a delicious menu of sandwiches, scones, cakes and cookies, and features the 5 historic teas involved in the Boston Tea Party. Apply today! Our customer service representatives do it all. Engage with guests from all around the world and personally interact with every customer that comes through our doors. Job responsibilities include museum ticket sales and box office, information, and being an ambassador to our guests. Apply today! If you would like to join the CAST of Boston Tea Party Ships and Museum, click here to apply online!